Lednice is a town which borders Lednice-Valtice Cultural Landscape UNESCO together with Valtice town. An extensive Baroque complex built by renowned architects for the Liechtenstein family consists of various chateau buildings (Lednice Chateau, Valtice Chateau and others), Romantic garden structures, decorative sculptures of various styles, greenhouses with tropical plants, ponds and woods. The area is crisscrossed with a dense network of hiking and biking trails. 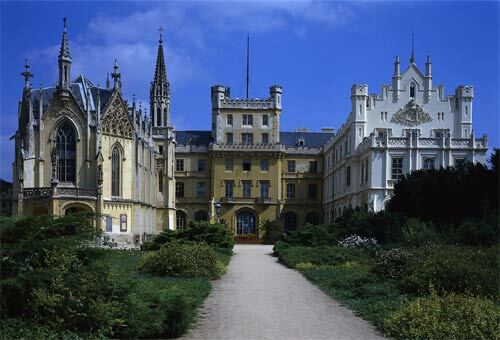 The most magnificent sight in Lednice is the chateau which is a combination of Baroque, Classical and Neo-Gothic styles. The surrounding park is laid out in an English garden style. In general Lednice is a pleasant SouthMoravian town significantly connected with Lednice-Valtice Cultural Landscape and viticultural traditions.